Weird things happen. I met Newton in Melbourne few days before Christmas. He must be a few centuries old, yet his face and his long hair was still same like his old portrait I used to draw when I was a kid. He sat alone on a bench looking out to Yarra River. Strangely no one could recognize him. I stepped closer, and asked, "Excuse me, sir... Are you Isaac Newton?" He lazily looked up to me, then nodded. How could you believe this? I know it was just a dream, but apart from it, everything else is true. 1. "I was just thinking about you," I said instantly. "I want to ask you about Einstein." "Oh yeah, that little kid Einstein again." "I'm three hundred years senior than Einstein. Am I rude to call him that or what?" "... No.... Certainly Newton can. I just wonder what you think about Einstein?" "About relativity. After your death, he's completely changed your physics world including your static universe model. Einstein said that Newton was wrong about time and space. Space is not flat, and time is not absolute as you thought. 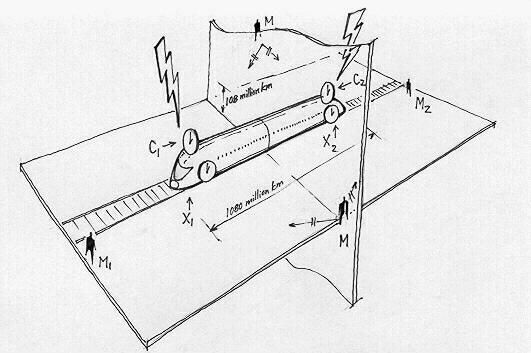 When an object moves, its time would slow down according to Einstein's equation. He even changed Galileo's velocity addition formula, and that c + c not equals 2c but still c. Einstein said nothing can travel faster than light, and the speed of light in vacuum is always measured as same regardless the speed of the observer and the light source. Simultaneity is not absolute, but also relative. What do you think about all that?" "Have you asked someone about all that?" "I've asked many physicists and still no one can convince me anything about relativity. They all make me feel like an idiot for I don't agree with them. You're the only one who never makes me feel that way, for I can read your books and understand them. Newton is so simple. And I think that makes you the genius, who can make idiots feel great for understanding you, not make them feel bad for never understanding genius. I always dream about this day when you would come to me. Can you give me the answer?" "I'm glad that you ask me. No one ever does. They've always asked what Einstein thinks about Newton, but never ask the other way. What's wrong with this world? I'm their ancestor. I'm the one who established the most basic physics foundation that the world is still using now. I don't mind if things change. But before they say Newton is wrong, before they abandon my absolute space-time for that super modern so-called revolutionary relativity theory, why didn't they ask me? Why not let Newton talk? Why not let someone speak on my behalf? Why not let two sides of argument present and let people choose? Why listen only to one side and have the truth as only what they're constantly fed to believe? Why fear of the other side? It's me, Isaac Newton standing on this side, that the world is against. People worry to speak against Einstein, but what about me? Does anyone give a damn about what I think when my absolute space-time demolished by Einstein?" 2. "Sir Newton, I'm listening to you now. What's your view about relativity?" "The kid Einstein has made some significant contributions to science, but all his ideas about time dilation and space curvature in relativity is nothing but a mess of language confusion." "I couldn't believe this. No one ever dares to say it." "Then, let the world know it's Newton who says it." "But everyone in this world now says Einstein's right about special relativity." "They're all wrong. Anything written against Newton is wrong. The whole world is wrong. Theoretical physics has gone to a wrong way. Generations have been taught a wrong theory. All theoretical physicists in your world are nothing but a bunch of arrogant scientists who have failed to teach what they truly understand and they can explain, but only what they don't and they can't. They teach without ability to convince, but only with power and authority to command people to believe. And all you people say it's right simply because no one is tested by me. No one bothers to test you if you agree with Einstein, but only test those who don't. No wonder so many people have to claim they support Einstein to avoid criticism. The whole thing is a fallacy. It's nonsense. It's crap. People in your world say Einstein has made a revolution about space-time. No, it's wrong. Einstein never made such a revolution. The revolution has never been succeeded, never been understood, and never will, simply because it's wrong. The true revolution is the only one made by Newton. It's there and forever." "Sir, can you help me to understand you?" "Newton can make anyone understand, even an idiot." 3. "Please tell me about Einstein's simultaneity, is it absolute or relative? "It's nothing. The fuss is all about choices of language rather than whether it's absolute or relative. It pretty much depends on what purpose you want to call it for. Any observer standing in the middle plane M could always test if the two clocks are identical, and therefore would always see those two clocks C1 and C2 run at the same rate with same readings. The absolute time can easily established throughout the universe by this simple imaginary method using the middle observer standing between any two places X1 and X2. In this flat and stationary Newton universe model, imagine each point in space always has a clock attached to it. All clocks are identical which can be tested and synchronized by the above method. An event E happens at place X when the clock attached to place X points to t, is called an event E happens at place X at the time t, or in short E(X,t). This time is absolute and cannot be relative. 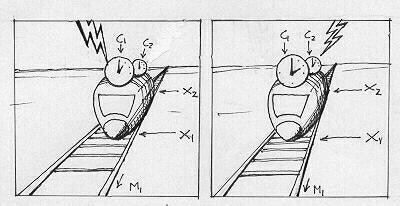 Let's go back to the giant train, all events happen at two ends (X1 and X2) of the train at the same time will always be observed to happen at the same time by the middle observer M. If this observer takes a photo of this train (if he stands far enough to take the full train in the photo) all events at X1 and X2 appear to happen at the same time in the photo did in fact happen at the same time. This simultaneity is absolute, and not relative. But other observers not standing at the middle of the train would see things differently. For instance, an observer M1 standing near X1 would always see the clock C2 runs one hour behind than C1, simply because all events at X2 need one hour to be observed at X1. If M1 takes a photo of the full train, he would see in the photo both clocks always showing different time, say if C1 is 2 o'clock then C2 would be 1 o'clock. And the opposite photo would be taken and seen by M2." "So what time was the train's photo taken by M1?" "You asked me a nonsense question. The photo might have been taken at 3 o'clock (according to the photographer's clock) and shows a picture of clock C1 at 2 o'clock and C2 at 1 o'clock. It only means everything we see happening at the same time on a photo do not necessarily happen at the same time." "Doesn't it mean you agree with Einstein that time is relative then?" "It means whatever you like it to mean. But the question is what do you need to say it's absolute or relative for, and are you absolutely clear about which word you're using or not? For instance, imagine both ends X1 and X2 of the train got hit by lightning at the same time 1 o'clock. And according to my absolute time defined above, I mean lightning struck X1 when C1 pointed 1 o'clock, and lightning struck X2 when C2 pointed 1 o'clock. This simultaneity based on absolute time is absolute and not relative. But those two events' images, which can only be observed some time later depending on the observer's position and distance, are certainly relative. Observer M would always see two lightning events happening simultaneously in his photo for he's standing at the middle. Observer M1 would always see lightning at X1 first in his photo for he's standing closer to X1. And observer M2 would always see lightning at X2 first in his photo for he's standing closer to X2. If you love to call it relative, you're certainly welcome to. But make sure you understand the difference between events and events' images viewed by different observers. And regardless whatever images they see in their photos, all observers can still make their own calculation and find out that both lightning events were truly happening simultaneously at the same local time of 1 o'clock. Events are absolute, but their images are relative. Simultaneity of true events is absolute, but simultaneity of their images, of course, is relative. 4. "So far you've talked only about absolute time of stationary clocks, what about moving clocks? Are they also absolute? Einstein said when an object moves its time would slow down. Don't you think it's possible? All physicists now say it is." "It's nonsense. Had that kid Einstein ever been lucky enough to be my pupil, I would've sent him back to learn more English literacy. Forget Math, learn English first. Learn your language first, so you understand yourself better and know better what you're talking about. That's the same thing I recommend all your theoretical physicists should do, before they have privilege to sit in my class and listen to Newton's lectures." "Sir, you mean Einstein's wrong about time dilation?" "In uniform motion, all objects' time remain the same regardless whatever speed they're travelling. Newton says it, therefore it's true. Time is absolute and it always remains absolute in uniform motion. No any clock would show different reading after an uniform trip. If it does, it's a faulty clock. Adjust it to the remaining stationary clock, or throw it away. The whole confusion about Einstein's time dilation is solely due to misinterpretation. Imagine we could travel between London-Paris in a straight tunnel of 3-light-hour length (300,000km x 3600 x 3). Put two above giant trains on this route, one stationary (a), the other (b) travelling at half of the speed of light, which will take 6 hours to complete one-way trip. There are two huge clocks (Oa) and (Ob) attached outside each train's ends, so huge that all these clocks can be observed during the trip by any observers comparing to their own clocks inside. These clocks are identical and have been tested to show absolute same time when stationary by Newton's method. After the trip, they both hand the two tapes to another third observer who knows nothing about the journey. The question, by just watching those tapes showing the trip in progress and two clocks in each screen, would this independent observer know then which train is moving and which is not? And that means all clocks, inside and outside, remain the same time (same rate, same reading) after the trip." "I've asked some physicists, and they say even though no difference observed during the trip, at the end of the trip, the clock which has been moving around would still show less reading than the one at rest." "It's nonsense. It's free imagination without any principle. They're free to say it, because no one has ever thought about a test in which both stationary clocks and moving clocks would be compared on the same screen. No one sees, so anyone can imagine. But if you put two clocks on the same screen, if there was a reading difference between the stationary and moving clock at the end, it has to be seen prior to the end. And that means two screens cannot appear the same, as it contradicts to the first postulate, which means that uniform motion is no longer uniform motion." 5. "What about length contraction?" "It's nonsense too. No objects' length would be shortened or contracted or altered anyway in uniform motion. Time and length remain absolute during uniform motion." "Is it possible that an object's length could be contracted while it moves, but because the observer moving along with the object with his ruler also being contracted, he can never possibly observe that contraction?" "Then who can possibly observe that contraction?" Newton asked. "The one who is stationary relative to that moving object." "But how? Can you take a photo of that moving object and show me its length has been truly shortened?" "Sir, the effect would be too small to observe as all objects' speed we know are too slow compared to the speed of light." "So you haven't seen it, right?" "The same excuse about free imagination without principle. Son, let me ask you this, if a sphere-shaped UFO travelling across the sky with the speed of 2/3c relative to Earth, could you, standing rest on Earth, take a photo and show me its sphere shape has been shrunk along its moving path on that photo? Yes or No?" "Sir, how can I take that photo if he travels that fast? I can't possibly see it to point my camera to." "You keep running away from the main point I want to say. Listen, I give you a simpler example about the giant train between London-Paris. Let's say the distance of London-Paris is 3 light-hours. The train is 1 light-hour long. You stand at the middle of the track but 10 light-hours away. Standing this far would help you to take a photo or film the whole journey within the viewing angle of 30o without moving the camera at all. Now watch on your stationary screen to see a train slowly crawl over a distance of 30o angle within 6 hours. Would you see any distortion on the train's shape? If you have a sphere-shaped UFO instead of a train, would your stationary camera see any contraction on its sphere shape when the UFO slowly crawls over a distance of 30o angle within 6 hours? Yes or No?" "Are you saying even the camera is at rest relative to its moving object, as long as its lens shutter is fast enough to catch clearly the moving object, or the camera stands far enough, it can only catch the object's image as if it moves along with it?" 6. "What about Einstein's equations? Don't you think Einstein's ideas about time dilation and length contraction are purely deduced from those math equations?" It's a nonsense deduction. It's a stupid interpretation. As far as uniform motion is concerned, it's arbitrary to say which one is at rest and which moving, and that means those equations have lost their meanings. Symmetry is the only simple reason Einstein's equations have failed in uniform motion. Using those failed equations in other accelerated motion to avoid symmetry and therefore predict time dilation is another nonsense, as those equations are specially designed only for uniform motion. So if we accept this motion is uniform, we have to accept its symmetry and that already makes time dilation obsolete. Whereas if we accept this motion is accelerated, then we cannot use those Einstein equations to predict anything either, simply because it's not uniform motion. In uniform motion, all objects' time and length always remain the same regardless what speed they're travelling at. Newton says space and time are absolute. If they are not, make them so. The problem with Einstein's equation is a direct consequence of his second postulate that the speed of light has to be measured the same regardless of observer's movement speed. It's wrong. It's nonsense. The speed of light might be a constant, like any other objects' constant speed, but it has to be measured differently by different observers plus or minus observers' own speed. In short, c + v has to be greater than c. Failure to do it, denying it cannot automatically make c + v = v, but only transform that math shortage into unnecessary disguise of time dilation and length contraction, which never exist in reality." 7. "What about non-uniform motion, are there any way to make time dilation happens?" "No. Time is absolute and always be absolute. Not only it is so, we need to say so for a good reason. I can give you an injection and make you frozen for 100 years, it doesn't mean time has been frozen, but only means your body has been frozen, and the clock you carry might still tick while you're frozen. I can drop your watch into the water, and it stops running. It doesn't mean time has stopped running, or you have stopped breathing, but only the clock has stopped running. Everything changes around us, dependently and independently to each other, and not always at the same rate. In order to measure those changes and their rates, we have to create an absolute space-time model , so that changes can be measured and rates can be calculated. If space and time also change, all measurement and calculation lose its sense. Having said that, since language is relative, you can certainly say time is relative, together with time dilation, length contraction, etc, ... and then try to find a suitable meaning for it. Say whatever you please, but don't screw up your own language. You understand what I'm saying?" 9. "I can understand that Einstein's relativity opposes your absolute space-time model, and you disagree with it. But the question is why people don't listen to you? If I go around and repeat exactly what you said, do you know what people would call me? They would use exactly those your remarks: idiot, nonsense, stupid, crazy, ... Do you ever wonder why this happens and what can stop it?" "Firstly no one has ever heard what Newton said about Einstein. I've been sitting here over 100 years and no one has ever seen me, let alone come and asked me like you. Secondly let me tell you this, son. You live in a crazy and stupid world. People don't need the truth, these days. Few do, but not everyone. They want power and authority instead. They want money and reputation instead. They want comfort and security instead. And those are what the truth does not always give. Having said that, I feel pity for you have come and asked me. I'd always expected someone else, some leading physicist in your world with enough brain and guts would finally come to restore my name, my honour and my world. Instead I have an idiot like you who knows nothing about physics. You're the wrong person, in the wrong place, at the wrong time. And the bad news is, you won't have happiness knowing the truth. In a world that everyone only cares for power and money, you're not what people want. If I, Isaac Newton, stood up and said all this, everyone would kneel down and beg for my words, because they know I'm Newton the greatest physicist of all times. I have power, authority, reputation, title and knowledge. I have everything people want, and people would believe anything I say regardless what I say. Unfortunately I cannot say for I'm already dead. You can say, and unfortunately you don't have my name. Even you would repeat what Newton says, no one would believe you. The pity is, sharing my knowledge you won't have happiness, but only rejection, frustration, confrontation, humiliation, isolation and sadness. It's the price of knowing the truth when you're not supposed to. You ask me why this happens and what can stop it. It just happens and nothing can stop it. The choice is yours. You believe, you say, you like, you listen. Time will tell." Newton stopped, and I did not know what to say. We both sat still looking to the tranquil Yarra river. From a distance we could hear an ambulance's squealing noise. Another accident, another day. Newton stood up, and looked a bit uneasy. 10. "What's wrong?" I asked. "Nothing. Do you like McDonald's?" "How do you find McDonald's food? Are they ok?" "Yeah, kids love it. Why?" "First time I ate a big mac this morning. I like the taste, but now something wrong turns up my tummy,..."
Newton looked around, his hand on his tummy. He actually looked a bit pale. "... Do you know any public place around?" Newton asked. "Oh, poor you. Yes, sir. You just go down under the bridge and turn left at the black wall. You won't miss it." "Thanks for talking to you." "Sir, can I wait here for you?" "Excuse me, sir. Have you seen an old man wearing a long wig and dressed up like in 17th century?" "... What.. what about him?" "Sorry, we're from Royal Park Psychiatric Hospital, and looking for a patient just run off yesterday. We got a call from someone spotting him wandering in this park. He often mistakes himself as the famous Isaac Newton. Have you been sitting here long?" "Have you seen anyone looks like him?" "Are you sure,... sorry, did you say that you're looking for an old man wearing long wig and dressed up in 17th century clothes?" "And you said, he called himself Isaac Newton?" "Yes, have you seen him?" "... and he's a mental patient who just run off from your hospital?" "Yes, but please tell me, have you seen him?" They were staring at me. "No, no, ... I see nothing, I hear nothing, I know nothing."